There are a few modes of adornment that can be used to identify a married Hindu woman. Typically, she’ll be wearing a red bindi ( a stick-on dot) on her forehead, she’ll have sindoor (a fine red powder) in the part of her hair, and she’ll be wearing bangles. And if she’s a newlywed, she may still have traces of henna on her hands and feet, and she’ll still be wearing her red and ivory chuda. 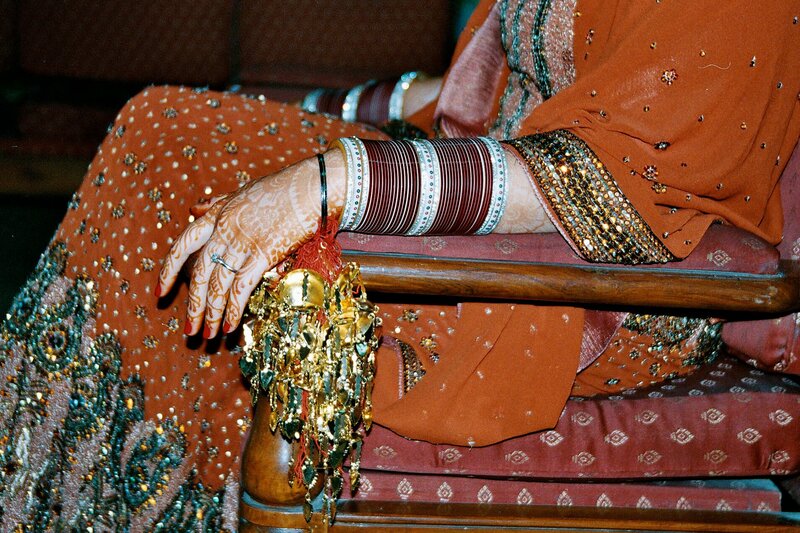 Newlywed women are supposed to wear their chuda, the red and ivory bangles put on right before the wedding, anywhere from one month to one year after marriage. 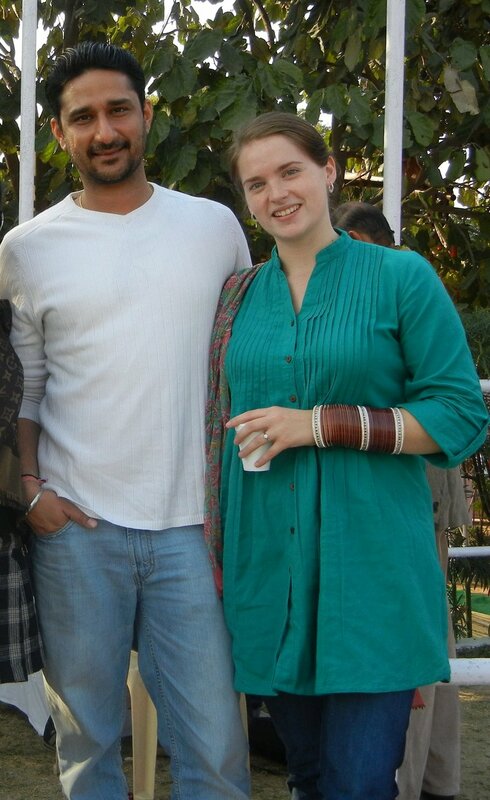 After my Indian wedding in December, I decided that I would try to wear my chuda for forty days, which is the minimum amount of time a bride can wear her chuda, if she chooses to continue wearing them at all. I chose to continue wearing my chuda partly for the same reason that I chose to participate in the Karva Chauth fast – because participating in an Indian tradition, as a foreigner, is well-appreciated by Indian friends and family. I also wanted to continue wearing them, though, because I thought they were beautiful and was proud to show of my status as a new bride. I do have to admit that I cheated a bit when wearing the chuda. Rather than wearing them around the clock for the full forty days, I would only wear them when I left the house. I would put them on in the morning, would remove them when I came home from work in the evening, and would put them back on if we were going out again or if we had company. I also didn’t sleep in them, which I imagine would have been quite uncomfortable. I felt okay with this system I had devised, though, because neither my husband nor my in-laws minded it, and it allowed me to wear the chuda comfortably for the full forty days. And sometimes I really enjoyed wearing the chuda. They were a great conversation starter, and I received several compliments from strangers on how beautiful they were, and how nice it was to see a foreigner participating in a tradition that many young Indian girls don’t even follow. Other times, though, wearing them was a nuisance. On more than one occasion I was reprimanded by Indian aunties who assumed I was a tourist wearing them simply because I thought they looked cool. It’s considered inauspicious for a woman to wear chuda before she’s married. So, while I appreciated the intent of these older women looking out for what they thought were my future marriage prospects, it became tiresome to continue to have to explain that I was, in fact, newly married to an Indian man. The ceremony to remove my chuda was similar to the ones conducted for the wedding and for putting the chuda on. There was a small havan, or fire, and we poured offerings into it while reciting Vedic texts. After I removed the chuda my mother-in-law presented me with bangles since, as a married woman, I should always wear something on my wrists. We wrapped the chuda up and put them in storage, along with Amrit’s turban, my kaliray, and our various other wedding attire, only to be pulled out again when we’re in the mood to reminisce. Have really enjoyed reading about your wedding. But oh, those aunties! I can just imagine. I got so paranoid about wearing too many obvious signs of marriage because of people’s assumptions that I was a tourist trying to look cool as well.